Prerequisites: One must not eat meat, eggs, or garlic, or consume alcohol on the day of the puja. 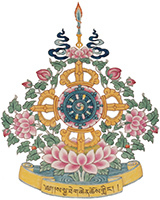 The Kunrik Puja will be led by the ordained at Sakya Monastery. The benefit of a Kunrik prayer service is a favorable rebirth (in the human realm for continued Dharma practice) for those who have passed away. For those who are sick, it removes obstacles. The service will include a Sur practice, which benefits those who have passed away by facilitating their passage through the bardo, purging attachment to objects and helping them to achieve harmony with local deities, nagas, and formless spirits. People should bring the names and photos of loved ones (including pets and other sentient beings) who are sick or have passed away. Those who cannot attend are welcome to submit names and photos via email to be included in these prayers. Participants may bring food, candles, fruit, incense, or monetary offerings for the shrine. In appreciation for their prayers, a monetary offering to the lamas is in keeping with Tibetan tradition. Please be vegetarian on the day of these prayers. If you are interested in helping to sponsor this puja, please contact our office (monastery@sakya.org or 206-789-2573).